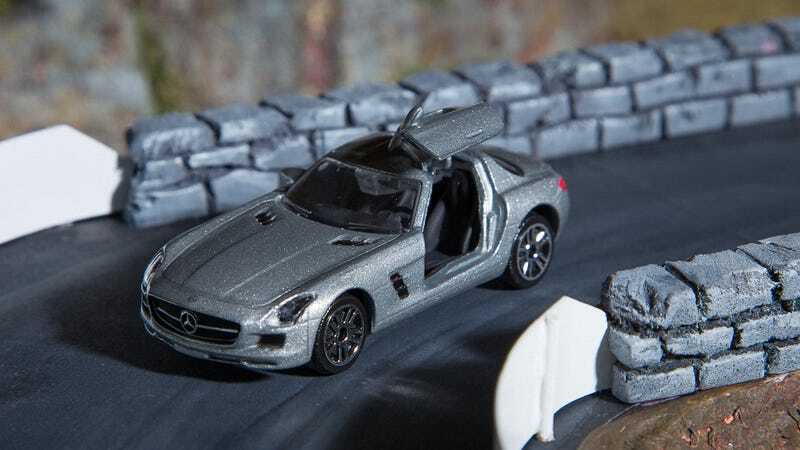 Here is the SLS with functional gullwing doors and sparkly silver paint that Jobjoris sent. Here it is with the Norev in dark red that he also sent. The Norev has more refined doors and is a beautiful piece. As you can see, the scale is pretty different! Both are really cool though, and of course the Norev is better. But I can play with the Majorette! Now maybe I can keep up with the cars that my boys have that can inexplicably fly all over the place . . .
You know how little guys are. Everything can fly!! And here is the AMG GT that he included! This one is very cool too. Scale is in keeping with the SLS. Opening doors are nice and details are good. The black AMG GT is from UCC Coffee that I’ve had for a while, so you can see the scale difference here. You can also see the nicely printed details on the Majorette both on the rear and front. Everything is really nicely lined up. Norev with opening doors compared to my UCC Coffee SLS. Both are fantastic and they complement each other perfectly! Heritage! That’s my UCC Coffee 300 SL. Majorette R8 in matte blue, Boss 302 in green, and a GT3 RS in matte black! The Audi is very toy-like. The matte blue paint is a little strange on this one. Maybe I should customize it? The Mustang is good, and the Porsche is really cool. A lot of these guys have the same wheels, just like Hot Wheels does. This GT3 RS is really cool, but it does ride high. I might drill it apart some time and see if I can lower it. I love the look though. Black on black is pretty cool! It has the GT3 RS graphics on both sides in gloss black as well. Very nice! And here’s the Weismann! It’s pretty cool too. Like the Majorette’s, this Siku is large compared to 1/64 cars. I’m not sure if I want to completely customize it or just detail it.